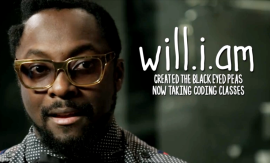 Coding is the language of STEAM and all youth should have the opportunity to learn how to code and create technology. We support coding programs and organize “hackathons” where students learn to code, make their own apps, work with mentors to develop their projects, and have the chance to bring their tech ideas to life. Since 2013, we have supported 13 hackathons, serving over 500 students who have created hundreds of coding projects. We partner with leading technology companies, community organizations and educators to provide computers, instruction, and mentorship to underserved students, so that they can have equal access to learning how to code. 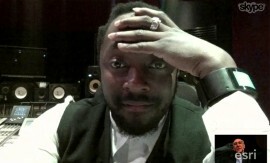 Hack for L.A. 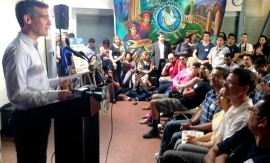 Kicks Off in Boyle Heights! 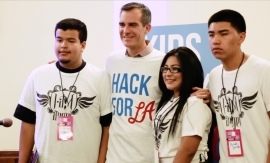 i.am.angel Students Demo Apps to Mayor Eric Garcetti at Hack for L.A.
Hack for L.A. Returns to Boyle Heights For Computer Science Education Week! 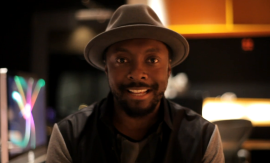 will.i.am and the i.am.angel Foundation Support National Day of Civic Hacking!